A remarkably complete fossil skull discovered in Kenya reveals what the common ancestor of all living apes and humans may have looked like, according to a new study involving UCL research. The find, announced today in Nature, belongs to an infant that lived about 13 million years ago. It's a significant discovery that will help researchers uncover whether the common ancestor of living apes and humans originated in Africa and what these early ancestors looked like. The study involved a large international team including Professor Fred Spoor at UCL and was led by Professor Isaiah Nengo of the Turkana Basin Institute, Stony Brook University and De Anza College, USA. Among living primates, humans are most closely related to the apes, including chimpanzees, gorillas, orangutans and gibbons, but little is known about their last common ancestor. "We've got many spectacular fossil finds showing how humans evolved in Africa over the last six to seven million years, since our lineage split from that of the chimpanzees. However, the evolution of the common ancestors of living apes and humans before 10 million years ago remains elusive," said study co-author Professor Spoor, UCL Cell & Developmental Biology and the Max Planck Institute of Evolutionary Anthropology. "Until now, relevant fossils are scarce and incomplete which is why this new discovery is extremely important for furthering our knowledge." 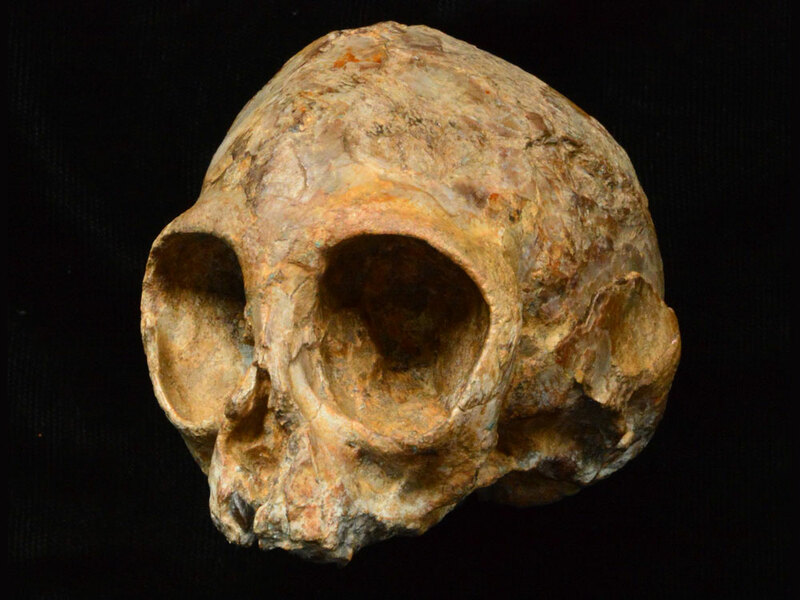 The ape fossil, nicknamed Alesi by its discoverers, and known by its museum number KNM-NP 59050, comes from a critical time period in the African past. It is the most complete known in the fossil record and was spotted in 13 million year-old rock layers in the Napudet area, west of Lake Turkana in northern Kenya, by Kenyan fossil hunter John Ekusi in 2014. Analysis of the skull indicates that the specimen belonged to a new species called Nyanzapithecus alesi, named after the Turkana word for ancestor "ales." "Nyanzapithecus alesi was part of a group of primates that existed in Africa for over 10 million years. What the discovery of Alesi shows is that this group was close to the origin of living apes and humans and that this origin was African," explained lead author Professor Isaiah Nengo. Many of the most informative parts of the skull are preserved inside the fossil, and to make these visible the team used an extremely sensitive form of 3D X-ray imaging at the synchrotron facility in Grenoble, France. "We were able to reveal the brain cavity, the inner ears and the unerupted adult teeth with their daily record of growth lines. The quality of our images was so good that we could establish from the teeth that the infant was about 1 year and 4 months old when it died," said Dr Paul Tafforeau (European Synchrotron Radiation Facility). "Until now, all Nyanzapithecus species were only known from teeth and it was an open question whether or not they were even apes," noted Professor John Fleagle (Stony Brook University). "Importantly, the cranium has fully developed bony ear tubes, an important feature linking it with living apes," added Dr Ellen Miller (Wake Forest University). Alesi's skull is about the size of a lemon, and with its notably small snout it looks most like a baby gibbon. "This gives the initial impression that it is an extinct gibbon; however, our analyses show that this appearance is not exclusively found in gibbons, and it evolved multiple times among extinct apes, monkeys, and their relatives," said Professor Chris Gilbert (Hunter College, New York). That the new species was certainly not gibbon-like in the way it behaved could be shown from the balance organ inside the inner ears. "Gibbons are well known for their fast and acrobatic behavior in trees, but the inner ears of Alesi show that it would have had a much more cautious way of moving around," said Professor Spoor. The work was supported by The Leakey Foundation and trustee Gordon Getty, the Foothill- De Anza Foundation, the Fulbright Scholars Program, the National Geographic Society, the European Synchrotron Radiation Facility and the Max Planck Society.